Driving on the road alongside tractor trailer trucks in Massachusetts can be an intimidating and dangerous situation. The effects of being involved in a truck accident can far outweigh the consequences of being in a car accident with another car. If you have been involved in a truck accident in Massachusetts due to the recklessness, negligence, inexperience, or exhaustion of a truck driver, you may be entitled to compensation. Stephen M. Forlizzi is an injury attorney in Massachusetts and has 30 years of experience dealing with accidents and helping victims know their rights. 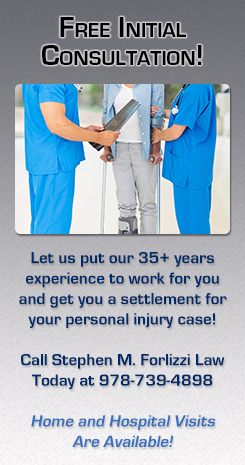 We work tirelessly to help victims get the compensation they need to recover when they have been injured. Truck accidents can be devastating for car drivers due to the sheer size and weight of the trucks. These injuries or other injuries can lead to mounting medical bills, long term rehabilitation, and lost wages. Victims may lose the ability to ever work again, which can directly impact their families. Truck accident victims may also have to deal with lifelong pain and the inability to enjoy life as they once did. Our firm will give your individual attention so we can get a true understanding of your situation and the impact a truck accident has had on your life. We will gather evidence, such as driver logs, take witness statements, and keep you informed every step of the way. We will fight aggressively to get you the compensation you need. We will also dedicate ourselves to getting a timely resolution for your case so you can focus on recovery. We offer a contingency fee arraignment that provides for legal fee only in the event that we are successful in achieving financial recovery in your case. Call the Law Office of Stephen M. Forlizzi today for a free consultation about your truck accident case.